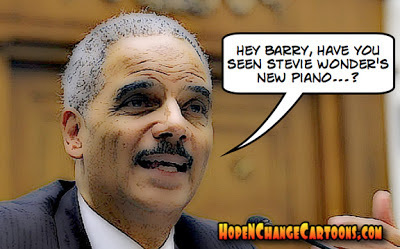 As Attorney General of the United States, Eric Holder has been a busy, busy man - attempting to prosecute the intelligence officials who helped find Osama bin Laden, protecting the rights of the New Black Panthers to intimidate white voters at the polls, doing his best to bring terrorist "show trials" to New York, filing lawsuits against states which try to enforce immigration laws or prevent voter fraud, and shipping guns to Mexican drug cartels to use in spectacular, blood-drenched massacres. No wonder he's had no time to look into the massive number of high-level security leaks coming out of the Whitehouse! But Mr. Holder has found time for an issue more important than any of those listed above. And that critical issue is, of course, "disability etiquette." No, no - we're serious! Mr. Holder just made a speech in recognition of Disability Awareness Month in which he declares that all DOJ employees are now going to receive training on the government's new "disability etiquette" protocol which is filled with helpful tips for interacting with the differently abled. For instance, the government says when speaking to blind people, “don't be afraid to use common expressions that refer to sight, such as, ‘See you later.’” Although it's still wrong to say that you're "keeping an eye out" for Peter Falk movies, and highly questionable to say "Hi, good lookin!" to a woman swinging a white cane. The government tells us that you shouldn't lean on someone's wheelchair (and who hasn't wanted to do that?) - especially if that "someone" is Stephen Hawking, because his computer voice will insult you with polysyllabic words you don't even begin to understand. Additionally, you should not refer to a person with a psychiatric disorder as "crazy," or buy any quick-drying liquid adhesive unless it's sensitively labeled as "Psychiatric Disorder Glue." And if you encounter a man with no arms and no legs, it is absolutely inappropriate to snicker and ask if his name is Bob, Art, or Matt. Although if he's crawling on the furniture, no one could possibly blame you for asking, "Are you Dustin?" The list of government "disability etiquette" tips goes on and on - every syllable paid for with precious tax dollars despite the fact we're in a crippled economy. Or, um, a differently abled economy. In all seriousness, Hope n' Change likes a lot of the suggestions on the list because we believe in mainstreaming people with disabilities and breaking down the social barriers which can hinder and stigmatize their lives. No one should be defined by their disability - period. And to be perfectly fair, we don't expect Holder to invest too much of the DOJ's time on disability etiquette, because he'll soon be assigning DOJ personnel to more urgent matters. Like filing hundreds of lawsuits to challenge the election results when Mitt Romney wins the election. Black people, however, can still tell this joke. First things first: today's cartoon is something of a placeholder until we can post something about last night's second Presidential debate (which is still hours away as we write this). But that being said, what a load of codswallop we're being handed in the ongoing Benghazi scandal. Specifically, to take pressure off of Barack Obama during the debate, Hillary Clinton suddenly decided to change her story entirely and take complete responsibility for the security failings which led to the successful Al-Qaeda attack on our consulate, and the brutal murders of four Americans. But wait - what does she mean by "complete responsibility?" It seems that she means she'll take complete responsibility for looking to see which "security officials" working under her should have prevented this massacre, and will then study solutions to make sure it doesn't happen again. No sooner was this highly unconvincing mea culpa out of Hillary's mouth than she hopped a government jet to whisk her as far from inquisitive reporters as possible - specifically to a conference in Peru to discuss women's rights, ride llamas, listen to Andean pan flute music, and (like her boss) claim that she can't answer questions clearly if she's too far above sea level. And unlike the consulate in Benghazi which she left defenseless against Al-Qaeda, Mrs. Clinton will be fully guarded at all times. Perhaps in case she's attacked by the radical llamas of Al-Paca. Okay, we're doing a latenight debate recap after all. Mostly because the darn thing wasn't particularly exciting to watch, and we didn't immediately see any raw meat to go after. 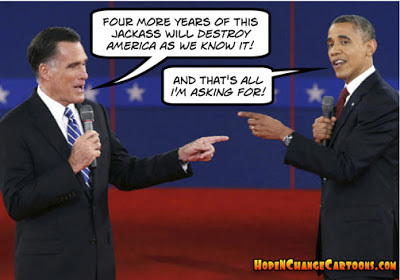 Both men did well tonight: Romney always sounded confident, caring, and in charge of the facts. Barack Obama was far more animated than his previous debate debacle, but also came in with a clear checklist of annoying behaviors to attend to (perhaps coached by Laughing Joe Biden): interrupt frequently, ask the moderator to cut off time or change subjects, blather on after the moderator said to shut up, call Romney a liar, and repeat many of the lies ("$5 trillion in tax cuts to the filthy, women-hating, racist rich") which Romney smacked down last time. We don't believe that Romney lost any ground, but Obama groupies or voters with untreatable head injuries may have found more to like about the president this time around. So we'll reluctantly call this debate a draw under the theory that a small but significant minority of Americans (particularly the so-called "undecideds") are spectacular dumb asses. Candy Crowley didn't do a terrible job as moderator - although she tilted the questions and answers in Barry's favor a bit too obviously, gave him 10% more time for responses, and frequently cut off Romney as he was making substantive points. But because she kept Carrie Fisher (dressed as "Slave Leia") chained to her side throughout the debate, we're willing to forgive her. Yesterday, parachutist Felix Baumgartner stepped out of a perfectly good space capsule 24 miles above the Earth and set new records for highest freefall, fastest freefall, longest freefall, and the biggest balls since those held in honor of the wedding of Prince William and Kate Middleton. And Hope n' Change isn't going to try to make some strained political metaphor out of Baumgartner's accomplishment (other than the joke above). Truth be told, in these trying times we just want to celebrate a hero - who reminds us that great things can still be done by private enterterprise and, especially, a courageous and motivated individual. This was no simple Evel Kneivel type stunt, like trying to get a steam roller to jump over an entire Occupy Wall Street encampment. Rather, this was a scientific mission intended to push the limits of our knowledge about parachuting from an unthinkably dangerous height - critically important in case of another shuttle-type disaster in which our astronauts need a chance of surviving a high-velocity, unprotected return to Earth. The dangers were myriad and almost too terrifying to list. There were many, many ways that Baumgartner could have died horribly - and only one way he could survive, if everything went perfectly. Which is, thankfully, what happened. So let's take a moment to forget the "You didn't build that" negativism of this administration and just savor this stunning example of determination and courage. On an entirely unrelated note, I'm looking forward to providing casual security at a Dinesh D'Souza (conservative author and man behind the "2016" movie) event this evening in North Texas. And by "casual security," I mean that I get an official event t-shirt and if Dinesh is attacked by protesters from Code Pink, I'll be expected to throw myself on top of shrieking women dressed as giant dayglo pink vaginas. Hey, if Felix Baumgartner was willing to take the leap, it seems like the least I can do.